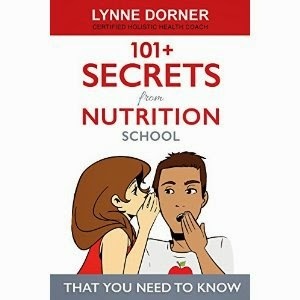 "101+ Secrets from Nutrition School," by Lynne Dorner, teaches you how to take control of nutrition and use it to improve your life. Dorner, a certified health coach, shares secrets she learned from her nutrition education in a way that is easy for the average person to grasp. The book is formatted so that each secret is a page long and accompanied by a page-length illustration. I feel this is the perfect size for the info, not overwhelming yet at the same time complete. One of the main principles of the book is that every person is different, and you need to take bio-individuality into account when addressing your health. The book's content really runs the gamut, from information about what organic foods you should buy to meal prep advice to info on caffeine. This would be a great book to mark your favorite pages with post-it notes so you could keep your favorite info handy when preparing a meal or going shopping. I'd recommend this book to anyone who wants a practical book on nutrition!